Awesome mod, it gave me a really good improvement, do you plan on optimizing more stuff? Thanks, I'll definitely optimize more stuff. I'm working hard on the vanilla compatibility (+ installer) and I have a few ideas for optimizing TileEntities. All I need is suggestions of things in the game that are laggy and could have a improvement. is there some sort of guide to which algorithm to use for which computer? Not yet, it really depends by your processor and your graphic card. You can try to test each of them. My friends base is a mess that kills your frames, but this mod seems to fix that easily. Aren't those trig ratios? Like, do you mean yaw and pitch? Are you asking if the mod only affects yaw and pitch? No, it affects a bunch of math that render stuff like particles, the sky, name plates and lots more. "seems to be worst" --> "seems to be much worse" btw I like this mod. Good for you. :) Is this compatible with every other mod or does this directly edit the minecraft classes? Sounds like you have it down. Can't wait to try this out and see how much less choppier my game is because I am getting a bit tired of my game randomly glitching and freezing up on me. Edit: My game is not as glitchy and doesn't freeze up on me as often now. I may experiment with running into several mobs because usually what happens is I get this big lag spike of death and when the lag is over I'm...dead. I'll let you know what happens. Are lag spikes due to frame rate drops or is it the latency or is that basically the same thing? Well, in the current released versions, BetterFps do not interfere with death processing, it must be vanilla latency or something else. You can try adding Optifine, I think it have a "death spike fix" option. Maybe I should try to fix it in the next update?! "I think you mean improvements." 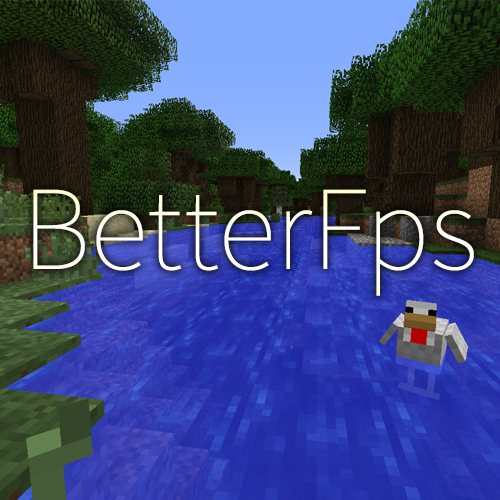 Anyways please keep working on maximizing fps for minecraft its the most useful type of mod as of these days. Since people can now have 100's of mods in a single pack. Thanks, I have a lot plans to optimize how Minecraft render things (like transparent blocks), and maybe TPS stuff too.